What does HealthKit mean for healthcare? The world has been mesmerized (as always) by the Apple WWDC. One of the areas which is generating a lot of interest and excitement is Healthkit. Heck, we wrote about it as well. Healthkit’s website describes it as something that “allows apps that provide health and fitness services to share their data with the new Health app and with each other. A user’s health information is stored in a centralized and secure location and the user decides which data should be shared with your app.” Words like “game changing” and “revolutionary” are being thrown around. But I’m not so sure if those are the words I would use. The direct primary care and concierge physicians were all for it. Why? Because most of their patients (and they themselves) were iPhone users. They could also see how this would allow them to provide a higher level of service to their clients. Almost every other physician felt it would have almost zero impact on their patient population. What is challenging to me is how to say what I want to say without getting into a flamewar. So let me set the baseline - I have an iPhone (have had every alternate year’s model), own a Mac or two, own an iPad or two. So I do like Apple products. This post is not about Apple or its products. This post is about trying to provide some opinions on the likely impact of Healthkit and the quantified self movement in general. This has been written up about quite a bit. We all know this so I won’t belabor the point. However, the key point to note here is that…. People with chronic diseases do track some of their activity per this Pew report. A closer look at the data, shows this set of data. 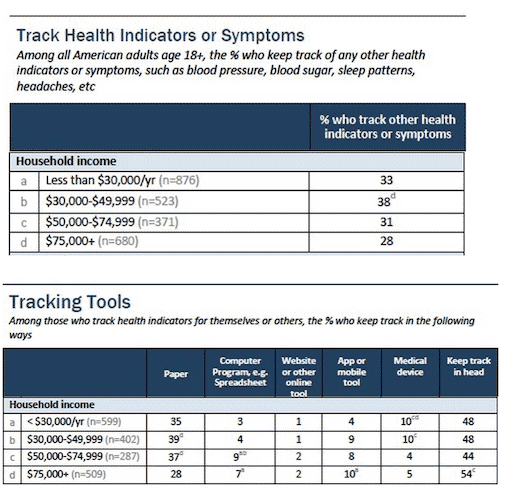 Basically indicating that the populations most in need of tracking health don’t do it as much nor do they use electronic means to do so. 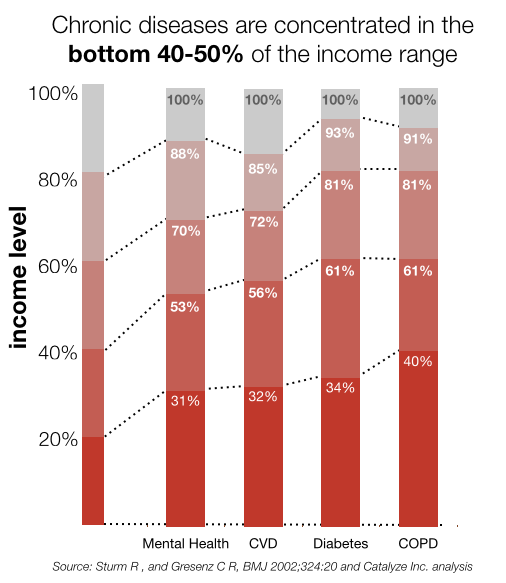 Let’s add one more factoid to this set of data - the distribution of iPhone and Android across income levels. Put all that together and we realize that the population most in need of tracking tools are barely using or impacted by Healthkit. 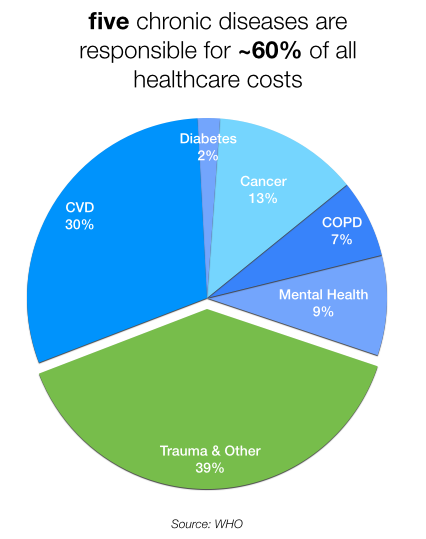 My physician friends were right - Healthkit is likely to have little to no impact on actually addressing the key challenges around chronic disease. Sharing should be encouraged so perhaps the move to present a default way to access and view summaries of the data could be welcomed. The concern that the physicians I talked to had was that, while patients being more interested in their health is always welcome, more available data implies more time, more correlation, and potentially more liability. Great journeys begin with a single step. I’m a big fan of the quantified self movement as it is my hope that this will extend soon to folks who are likely to benefit the most from it. Perhaps Apple putting its considerable weight behind it will just be the impetus it needs to make it more widespread. So, to answer the question I posed in the title, “What does HealthKit mean for healthcare?” - not much in the in the immediate term. What does HealthKit mean for mobile app developers? HealthKit is important for developers — both data collectors and digital health app developers. Who's really interpreting and enforcing HIPAA for startups? Breaches and fines have been big news recently because a malicious hacker, or group of hackers, was able to gain access to health records.